Just because it’s winter doesn’t mean you can’t have a salad. In fact, winter is a great time to eat a bowl of healthy greens – chock full of vitamins, nutrients and fiber, a sure-fire way to keep the doctor away. While summer salads are often light and ethereal, winter salads have heft, laden with all sorts of goodies like nuts, cheese, and dried fruit. 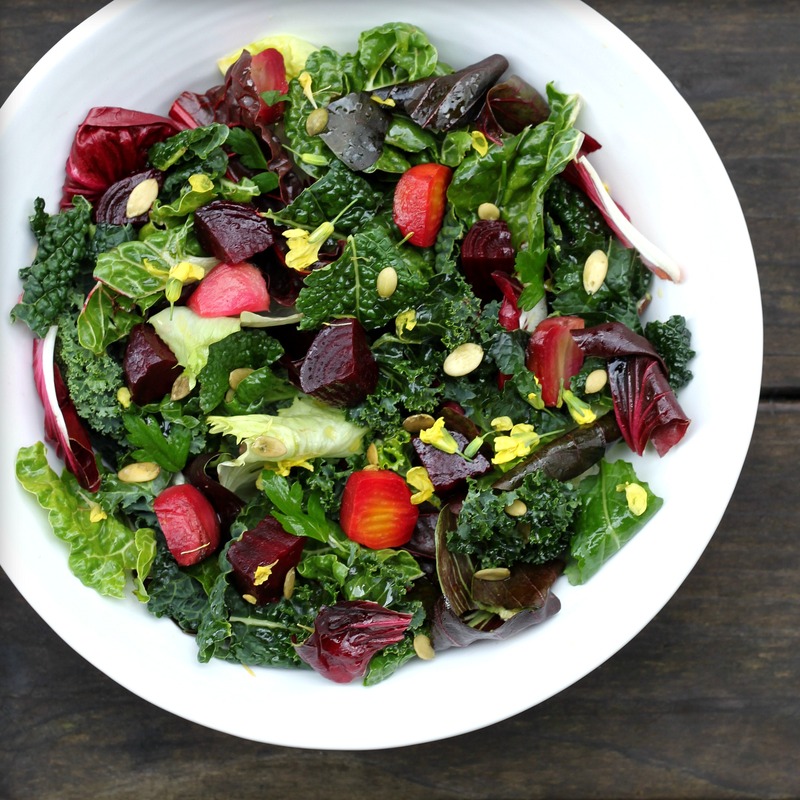 This recipe is brimming with baby kale, spinach, radicchio, and chard, sprinkled with nuts and seeds, and sweetened with roasted beets. A rich and potent vinaigrette naps the leaves, taming and binding the bitter, nutty, earthy flavors. I make a dressing, with rich, sweet and viscous balsamic, and slightly thicken it with Dijon mustard, so the dressing is sure to cling to the leaves. Mix and match your favorite greens from what’s available in the farmers market. Be sure to include a combination of bitter and mild flavors as well as a variety of color and texture. For this salad I used spinach, chard, baby kale, radicchio, and arugula, and flowering broccolini as a garnish. Whisk the vinegar, garlic, mustard, salt, and pepper in a small bowl. Add the oil in a steady stream, whisking constantly to emulsify. Cut the beets into quarters or halves, depending on the size. Place the greens in a large bowl. Add half of the dressing and toss to thoroughly coat. 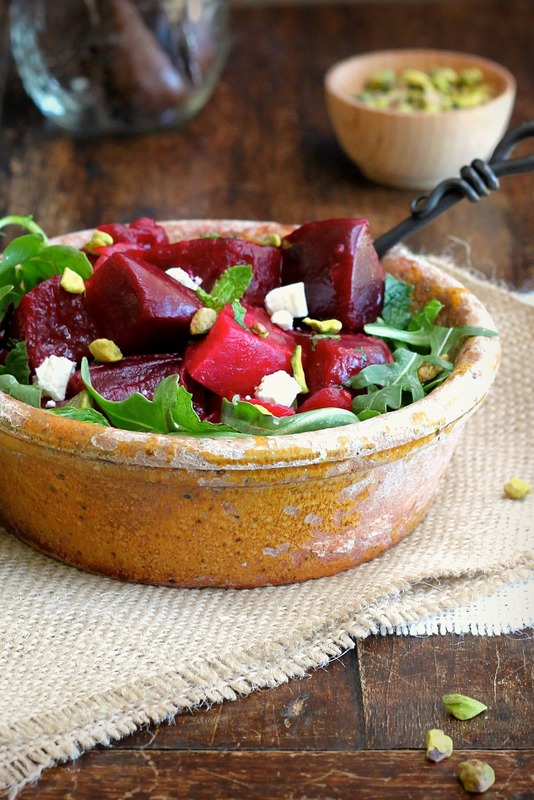 Scatter the beets, pistachios, and pepitas over the salad. Drizzle with the remaining dressing to taste. 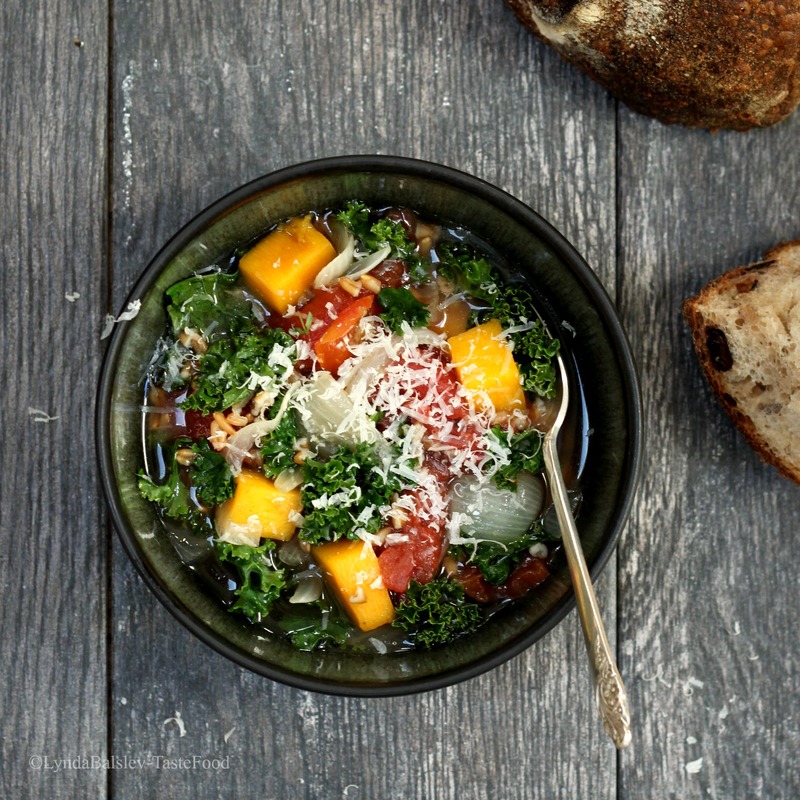 I make a version of this soup throughout the fall and winter. The recipe is easy and delicious, following a simple template which I switch up with different seasonal vegetables, often a grain, and sometimes beans. The basic stock is chicken, to which I add a can of Italian plum tomatoes for fruity acidity, plus a hunk of Parmesan rind which breaks down while cooking, adding a little oomph (aka umami) to the broth. From there I embellish, adding a grain, such as farro or barley, and chunks of sturdy vegetables, such as fennel, butternut squash, and carrot. If I crave more substance (think one-pot dinner), I’ll dump a can of cannellini beans or chickpeas into the mix. Finally, I stir in chopped hearty greens, such as kale, mustard, or spinach, and simmer until they just wilt but remain bright and fresh. You can do this too – use the following recipe as your template, and mix and match the veggies and grains to your taste. Heat the oil over medium heat in a soup pot. Add the onion and sauté until it begins to soften, about 3 minutes. Add the carrot or squash and the fennel. Saute until brightened in color, about 2 minutes. Add the barley and stir to coat, then add the tomatoes, chicken stock, cheese rind, bay leaf, thyme, salt, and pepper. Bring to a boil, then reduce heat to medium-low, cover and simmer until the vegetables are tender and the barley is tender, about 30 minutes, stirring occasionally and breaking up the tomatoes with a spoon. If the soup becomes too thick, add more stock as necessary. Add the beans, if using, and bring to a boil, then add the greens and simmer until bright green in color and just wilted. Taste for seasoning. Serve hot with grated cheese. Here is a healthy gluten-free appetizer that’s perfect for holiday entertaining . I can’t get enough of these wraps, and neither can my guests. Not only are they delicious, they are pretty to look at. 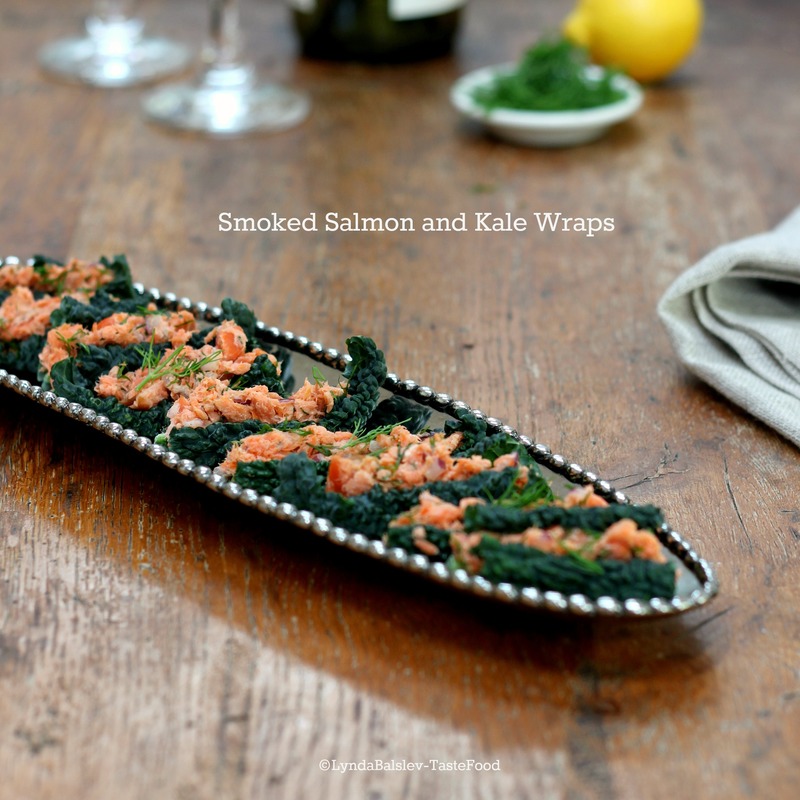 Crisp kale leaves are stuffed with a delicious salad of warm-smoked salmon, lemon and dill. Thanks to the sturdiness of the kale leaves, they can be assembled in advance. I recommend making an extra batch of the salmon salad, because it’s that good. The narrowest parts of the kale leaves work best for these wraps. Combine the salmon, yogurt, lemon juice, red onion, capers, and Tabasco in a bowl. Stir with a fork to blend. Add the salt and black pepper and taste for seasoning. Fold in the chopped dill and the chives. Cut the kale leaves crosswise into 2 inch pieces. Place 2 to 3 teaspoons salmon salad in the center of the leaves and fold the leaves around the salmon, pressing gently to hold in place. Repeat with remaining kale leaves. Arrange the wraps on a serving platter. Sprinkle with lemon juice and garnish with dill sprigs. Farro stands in for rice in this easy stove top dinner. 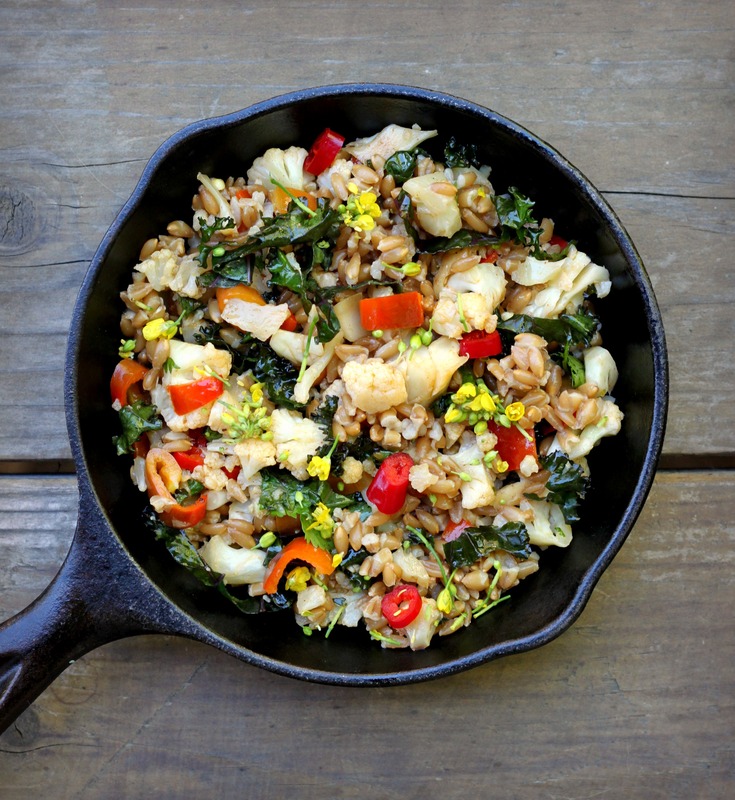 Cooked farro is added to a sauté of seasonal chopped veggies – in this case cauliflower, peppers and purple kale. It’s a great way to use up your veggies Almonds are an optional addition, adding extra protein and great crunchy texture to this satisfying dish. I used what I had on hand from the farmers market, including bok choy flowers for garnish (not necessary but very pretty). Bring the farro, stock or water, and 1 teaspoon salt to a boil in a medium saucepan. Reduce the heat to low, cover and simmer until the liquid is absorbed and the farro is tender, about 45 minutes. Heat the oil and red chili flakes in a large skillet over medium heat. Add the cauliflower and carrot and sauté until crisp-tender, 4 to 5 minutes. Add the peppers, garlic, cumin, and paprika and sauté until fragrant, about 1 minute. Add the kale and sauté until the kale wilts, about 1 minute. Stir in the farro, almonds and cilantro. Season to taste with salt and black pepper. Serve warm.